Should You Go with the Vertical Mastery Jump Software System? Does Vertical Mastery Really Give You Ups? Vertical Mastery says that by training the areas you’re weakest in, you’ll be able to see the quickest gains in your vertical jump. Rather than taking a one size fits all approach and starting off on the same step that everyone starts off on, they customize a program based on what you need help with the most. Sounds like a logical way to go about things, but does this work better than some of the other jumping programs out there? His Airness. Kobe. King James. Blake Griffin. They all had or have the ability to take flight that leaves the crowd roaring, and thousands of NBA hopefuls wanting to try to pull off the same sort of moves. Plenty of programs out there promise to tell you how to train for a better jumping ability, and there are even special shoes you can buy that say they help grow the right muscles, but how can you know which ones to try and which to sidestep? When something like Vertical Mastery comes around, we like to see what angle they are coming from to see if they’re legit. Vertical Mastery is not short on claims. They say that they are not just an ebook or a video program but that they are a jump training software, so that you can interact and track your progress with it. They also say that they create custom training programs so that you don’t end up wasting time building up areas of your body and abilities that are already near their peak. They also claim to give you the option of going with no weights, so you can perform the exercises without having to buy any additional equipment if you don’t already have some. They’ve also got a collection of exercise videos so you’re never left wondering exactly how they look when you perform them. One thing that separates this from most vertical jump programs on the market is that they claim you can get free coaching in addition to all of the other features and products that it comes with. They also say that as you go through the program your training will adjust itself to your newfound gains. By adjusting with you it makes it more effective than you having to adjust to it. They also claim that when you’re in, you’re in. There are no upsells or additional things you’ll need to buy after you pay the one time fee. Everyone wants to increase their vertical because we all want to be like our favorite stars on the court or in other sports. The thrill of dunking a basketball is enough to create a strong desire in most people, which leads to products that say they can help you get the kind of hops you only dreamed about. 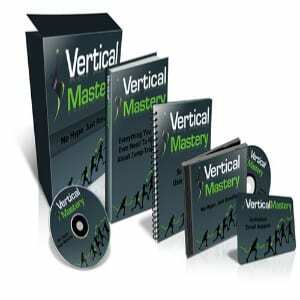 Vertical Mastery is a one-off payment of $67 comes with a 60 day money back guarantee so you don’t even have to worry about losing your money if it doesn’t work. You should definitely be able to see noticeable and measurable results well before the 60 days is up. If you want to jump higher you’re going to have to stick with a program like this long enough to see results. It can help you as far as shortening the amount of time it takes to see those results, but you still have to follow what it says to do, you can’t just sit around reading how to do it, or watching videos but not participating. You’ve already heard it many times before, but even the superstars spend hours and hours conditioning in the gym and on the court so they’re ready for game time. Vertical Mastery doesn’t leave you wishing it came with more stuff. It has workout charts which outline exactly what you need to do. It can show you how to figure out which exercises will help you specifically, so you get fast results and can stay motivated to keep on with your training. It even weighs in to what sort of foods you should be eating in order to be more athletic, and not have that heavy, weighted down feeling. There are also little tweaks that you can make that will get you immediate increases in your jumping ability, and that you can’t find in other programs. Part of the process is not only doing things right, but avoiding doing the wrong things. You can avoid injury, and avoid any slow downs to getting what you want. Vertical Mastery is doing a lot of things right. We like that they offer unlimited free support. Here’s how they’re able to offer it: Most people do not take them up on it, so they can handle hundreds of members, and only a few will ask for help. So be sure that you’re not one of them that doesn’t ask questions. It’s in their best interest to answer your questions, especially within the first 60 days because if they don’t you’ll just get a refund. This would definitely be on our list of jump programs to try, as it adds a technological aspect to jumping higher that no other program is currently offering. By tracking your progress, identifying weak areas, adjusting as your body gets better and giving you new exercises to push you past your comfort zone and sure that you don’t hit a plateau, this is something that you just have to pull the trigger on, especially since you’re covered by a two-month guarantee. What do you think? Does Vertical Mastery work or not? Does Jillian Michaels Shred-It With Weights Really Work? Does the Smoothxbike Really Work? What I would give if I could add just 2 inches to my vertical leap… I could dunk so cleanly if I could just jump an inch higher, but 2 inches would be even more spectacular. Right now I can grab the basketball rim with two hands very easily, but I need two more inches of vertical leap in order for that translate to in-game dunk. 2 inch, that’s all I need.